This is how the Apostle Paul began many of his letters to people of the early church. When I started thinking about my first thoughts I wanted to share with you, this greeting immediately came to mind. I’d like to explain further if I may. 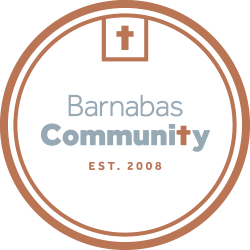 I have been on duty as the first paid Executive Director of the Barnabas Community for a little over three months now. In that time, I have learned so much and experienced so many emotions. As with all situations, those experiences and emotions are linked closely together. Some of the emotions I’ve experienced include joy, peace, humility, frustration, anger. I could go on, but a shopping list of emotions is not my intent. I know each of you has experienced many of these same feelings. Each time I leave Barnabas, I usually have at least a 30-minute drive to reflect back on my feelings. Usually, I can reconcile those feelings in that time, but there are times when a story or situation sticks with me. My goal in this reflection is peace. Can I feel peaceful about what I’ve experienced that day? Peace, I have found, comes most easily through grace. There have been many times in the past three months when I have been shown or given grace by others within our community. I’m not just talking about grace from our volunteers, staff or advisory board, but grace from those we serve. When I cannot help a person make strides toward overcoming a situation they are in, I feel horrible. It must show on my face because nine times out of ten, the other person says, “That’s okay. I know you would help if you could.” This, my friends, is grace. They could get angry. They could lash out. But instead, they show understanding that I sometimes cannot even fathom. But let’s do what we are able to do to help one another. Items that have been donated were donated so they could be given out. This is when we need to think about what Barnabas did. We need to remember what we are called to do in the scriptures: “Whoever has two tunics is to share with him who has none, and whoever has food is to do likewise." (Luke 3:11) Luckily, this scripture is on the south wall in the store to remind us each and every day. My goal in this position is to provide a bit of peace, even if it is just temporary. I hope I exhibit grace in my interactions with everyone associated with the Barnabas Community, and as a result, peace. If you can help me to do this or if I can help you do the same, please let me know. We are a community, after all. We are here to help one another. Please extend these acts of grace to one another. If you are working with another volunteer, compliment them on what they are doing. Offer to help them. If you see someone interacting with others in a hospitable or graceful way, point that out. By doing this, you can bring grace and peace to them from God our Father and the Lord Jesus Christ.